Much of the information in this section has been taken from the recollections of local lad David Dodd, Arthur Bell from the Royal Engineers and the book "The Memoirs of an Undistinguished Man", by Captain George Lucas, former owner of Bury House (published 1955). Geoff Gough remembers sitting in the front room of his family home, the former Three Horse Shoes on September the 3rd 1939, the day after his eleventh birthday, listening to Neville Chamberlain declare war. David Dodd was a lad aged 6-10 years living at Frog Island, Rockingham Road during the War. Says David: "One of my earliest recollections is of going to the clothing factory with my mother to collect our gas masks. I was most upset because I was just a bit too old to have a Mickey Mouse one! I also recall watching a mass practice parachute jump over the valley. Hundreds of planes dropping thousands of men, it looked just like it was snowing. We heard later that several of the men were injured, and some died, as a result of the exercise. Once, a parachute was found in the field next to the school (in School Lane then). I don't know if the parachutist was one of ours or from an enemy plane, but the 'chute was quickly cannibalised by us school children, and a few adults, until Mr Porter (the local headmaster) ordered us out of the field. The nylon parachute cord (I still have some) was very useful and I believe the ladies of the village found things to do with portions of the silk canopy. "One day we heard rumours that a plane had crashed somewhere South of East Carlton. A posse of us furiously pedalling our bikes headed over there but, in fact, the plane hadn't crashed but had landed relatively unscathed on a farm track ( I think it was the one leading to Darnell's Lodge). The pilot was there and told us to be sure not to go round to the front of the plane as he had set the machine guns to fire off all the ammunition to render the plane safe! Hilda Lavery (nee Beadsworth) has told us about the fantastic community spirit that there was during the War: "We used to share everything, pooling eggs, bacon and so on to make sure that everybody's children had enough to eat. We didn't waste anything either. If you got a saucepan with a hole in it, you put a block in it - you didn't throw it away!" Although Cottingham was only three miles away from the Corby steelworks (which the Germans knew about because their engineers had taken part in its construction), the few bombs that fell in the area fell in open country and not a single house within five miles of the village was damaged. The closest a bomb got to Cottingham was in Claypole's field about halfway between the old windmill and the Corby Road. It made a crater some 10 or 12 feet deep and 20 feet across. It was told at the time that it was either intended for Corby Steel works or was discharged before the plane returned to Germany. The nearby Eyebrook reservoir was used for bombing practice by the Dambusters before their attack on the German dams. David Dodd recalls: "From Frog Island we could often see the Eyebrook Reservoir glimmering in the sun, and aeroplanes dropping flares on to it. We learned later that this was in fact Wing Commander Guy Gibson and his comrades practicing for the Dambuster raids over Germany." During the War, some 45 British soldiers (from the 9th Armoured Division of the 11th Field Squadron Royal Engineers?) were billeted in the attics and outbuildings of Bury House and there were 17 army vehicles parked in the Spinney, which was where Bury Close now stands. The then owner, Captain George Lucas, built a bathroom and fitted out a games room for the men, recalling that, when an officer from the Military Authorities offered him six shillings and elevenpence a week in compensation for the billeting, "I marched him from the property saying that I considered his offer an insult and that under no circumstances would I accept a penny" Captain Lucas was true to his word and only profited from a kitchen carpet that the sappers left behind! Later in the war, a company of Czechs stayed at Bury House. Captain Lucas recalls that some of the village girls found the Czechs ‘too attentive’. Soldiers from the squadron were also billeted in the basement of the clothing factory on Rockingham Road and, in Middleton, at Burgess House (now Cannam House), in the loft of the adjoining house (then owned by the Healy family and since demolished) and in the back room of the Woolpack Inn. For a short time, there were also soldiers staying at Manor Farm until the then owner, Mrs Hunt, complained! Sapper Arthur Bell recalls how stone was quarried from the almost empty stone pit (where Stonepit Drive now stands) to make a hard standing for newly acquired transport vehicles at the back of Cannam House. The former Congregational Church on Main Street, Middleton was made available for the soldiers as a reading room but, being only lit by oil lamps, was not much used. Arthur also tells us that a Nissen hut was erected next to the War Memorial which was used for stores and occupied for a time as a billet. David Dodd remembers watching Italian Prisoners of War digging the foundations for a the hut. Says David: "There were British soldiers standing over them with rifles." David also recalls tanks practicing on rough terrain in a field on the right hand side out at the top of Rockingham Road. "One day, a large convoy of tanks came from Rockingham direction, right past Frog Island. There seemed to be hundreds of them, taking hours to go by. I remember the grown-ups complaining what a churned up mess they made of the road. Captain Lucas refused to accept any evacuees at Bury House, but there were evacuees staying at Cannam House in Middleton, and also in the cottages on the right hand side of High Street, where the garages now stand. David recalls: "One day Crane's lorry (the local carrier) arrived at the old school. About 20 children disembarked. Each one had a parcel tag attached bearing their name and maybe one or two other details. These were the evacuees, children from London who were to be absorbed into the local community away from the blitz. Only a few names come to mind now, 60 years on. One, however, was Ronnie Witt, who was taken in by a family in Middleton. He stayed on, whereas most of course returned after the war. There was one called Sneider whose name was translated to Tailor or Taylor for obvious reasons. Then there was Harry Farey who could tap dance, sometimes demonstrating his talents at Social Evenings." 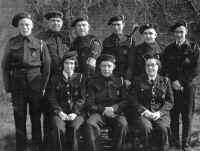 During the second world war, Captain Lucas organised the Corby Home Guard. 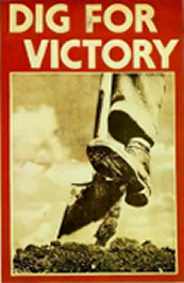 However, control soon passed to a director of the steelworks who already ran a large battalion engaged exclusively in protecting the works. Captain Lucas then became a Welfare Officer, but still had duties to perform, including many cold nights spent on the top floor of the clothing factory 'firewatching'. 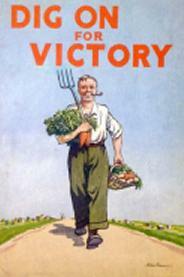 "When first sown with oats, the weather was dry and the wind cold, and as a result, wireworms got busy and half an acre was so bare that, answering the appeal for more green vegetables, I got the local Boy Scouts to hoe up the oats and, without any assistance, I planted the plot with Brussels sprouts. I tended them with more than a mother’s care and produced an excellent crop, but not having any labour available to pluck the sprouts, I sold it by auction and was bid £17 for it. "The sequel was amusing as, though I had stipulated that the crop must be off the ground by the end of February, the buyer would not come to get them. I pressed him to do so and he came, picked one sack and was chased off the ground by the village policeman. The end came when, after my neighbour’s bullocks had broken the fences and consumed a large part of the crop, my buyer sold it to another farmer, and it was consumed by sheep, but only after the second buyer had cut the sprouts and carted them off the ground. "After the oats came potatoes and what a ramp that was - the Government bought at £8 a ton and allowed the grower to put them on a cart and repurchase at one pound 10 shillings. I did not know the ropes and was content to accept the price and finish with it, but another adjoining farmer had 50 acres of good potatoes and made a packet of money out of it." David Dodd remembers the ARP wardens and the precautions that had to be put in place for air raids, having helped to construct the window blinds to stop light shining out at night. He says: "One chink and the Wardens would be knocking on the door!" "Before Ripley Road was built to its current length it was called Approach Road. Beyond this was a field where searchlights were installed and if we were lucky we boys were allowed to get up close and even search the skies for enemy aircraft. The picture opposite is of a presentation made at a party to celebrate the homecoming of cousins Bernard and Arnold Crane (pictured centre, in uniform, Bernard on left), who had been held prisoners of war. 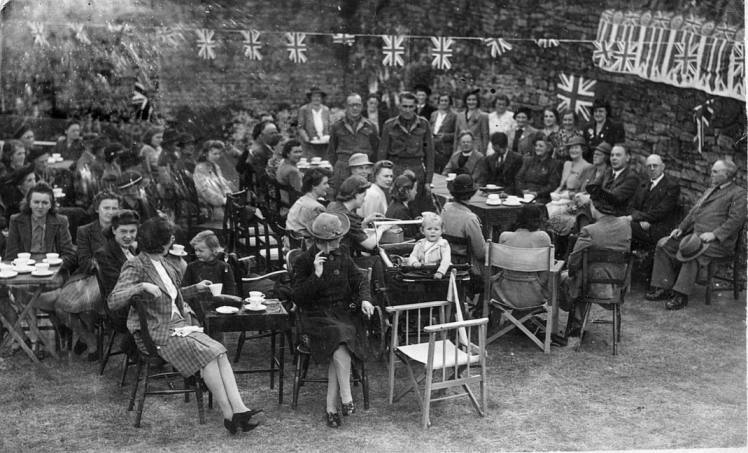 The party was held in the garden of Church House (the last house on the right as you walk up Church Street from the centre of the village) in June 1945.